I was innocently browsing through my twitter list yesterday when I came across this article on CNN. The gist of it is that many people are experiencing depression after watching Avatar because the fictional world depicted is so beautiful and amazing that life back here on earth seems drab and boring. Many people have responded to this story with shock and derision, and this definitely hints at some pre-existing issues for the folks who are feeling suicidal after watching a sci-fi film, but it also concerns me for another reason. It suggests a troubling lack of knowledge about the real world. This really bothers me, because despite all the nasty things that humans have done to the world, it is a far cry from a dying world! (And if our world really is “dying” then shouldn’t we be out there trying to save it rather than despairing?) I can tell you this: studying other planets makes you realize that Earth is a paradise. 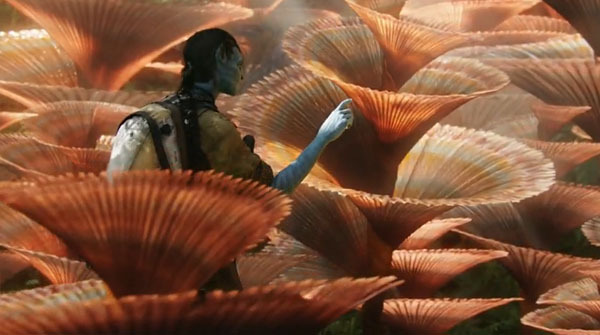 And believe it or not, many of the “creative” flora and fauna in Avatar are based directly on living things here on Earth, past or present. Remember those glowing spiral “plants” that Jake taps, causing them to curl up into their stem in the blink of an eye? They’re real! They exist in miniature in coral reefs around the world as “christmas tree worms”. Jake Sully walks in awe through a glade of giant christmas tree worms. Actual christmas tree worms in Bonaire. What about those glowing mushrooms that he plays like drums? Yeah we’ve got those. Again, much smaller, but similar. Glowing mushrooms really exist too! And of course the seeds of the Tree of Life are obviously based on real-world jellyfish. James Cameron is a guy who knows all about the weird living things on our planet. Heck, have you seen his documentary “Aliens of the Deep”? It’s pretty obvious where he got some of his inspiration for the creatures in Avatar! A deep-sea jellyfish from Cameron's "Aliens of the Deep". 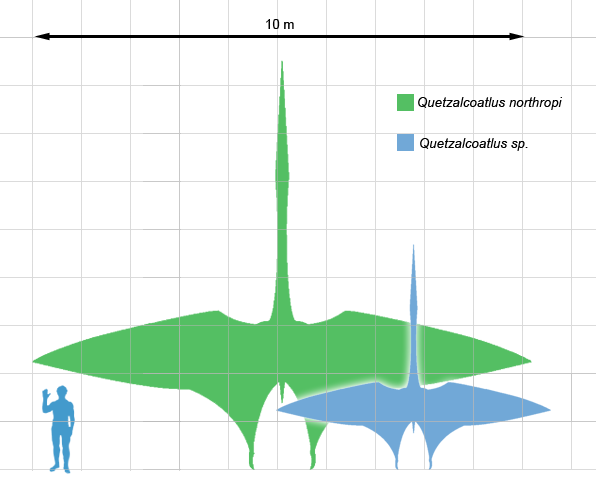 And how about good old Quetzalcoatlus, with a 30 foot wingspan? Spectacular crystal formations? Yeah, we've got that. My point is this: yeah, it’s a shame that Pandora isn’t real. I was sad too when the movie ended and the credits rolled. But the world we live in is just as amazing. You won’t get rid of the Pandora blues just by watching Avatar endlessly, or running out and getting the Avatar video game. But much of what was in the movie was based on real things here on Earth. Many of the photos I’ve shown here are relatively recent discoveries. There is plenty of wonder to go around and plenty more to discover. And if you get tired of Earth, there are other planets in our solar system. Tired of those? Check out exoplanets. Still not enough? Head into the realm of astrophysics and you’ll never get bored. And for those longing to live like the Na’vi there are options too. Anthropologists regularly study native cultures and learn their ways. Or you could become an archaeologist and learn about past cultures by studying their artifacts. Still not enough? Well, then instead of living in someone else’s fictional world, why not make your own? Become a science fiction or fantasy writer and see if you can do better than James Cameron. Who knows, maybe someday people will see your world and long to go there too. Avatar’s vivid world should not be a source of depression, it should be a motivation to seek out (or create) the beautiful and the interesting and the fragile in our own world, to study and learn from it, and to preserve it so future generations can experience the wonder as well. Click for the full comic from "Saturday Morning Breakfast Cereal"
Thursday at AGU started with a tough choice. At 8 am there was a talk about methane on Mars, and a special lecture about the water plumes on Enceladus, and plate tectonics on Venus! In the end I decided to go to the Enceladus lecture, given by Sue Kieffer. She explained that there are two primary models for how the Enceladus plumes form. The first is dubbed the “cold faithful” model, and involves pure water coming into contact with the vacuum of space, perhaps in an underground cavern, and boiling to create a plume of vapor and ice particles. (remember, if the pressure is low enough it doesn’t need to be hot for water to boil) The problem with this model is that gases detected in the plume would have to also be in the water, and when exposed to the vacuum they would come out of solution, much like a shaken can of pop, and so the amount of ice in the plume would be different from observations. The other model, which Kieffer prefers, is the “frigid faithful” model, which relies on “clathrates” – gas molecules trapped in cages of water ice. In this model, dense fractures in the subsurface ice act as conduits for gases, including water vapor, released from the clathrates due to the geothermal heating in the crust. In this scenario the fractures are constantly sealing themselves as ice condenses in the mouth of the vent, but re-open as tidal stresses fracture the crust. 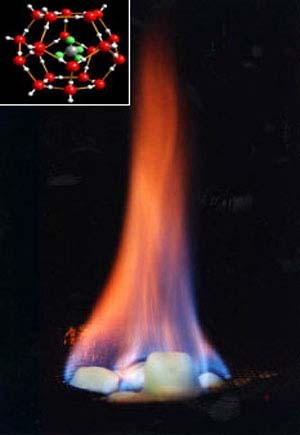 This clathrate has enough methane molecules trapped in the ice to burn! The enceladus lecture finished with a long question and discussion session. Some of the concerns with the “frigid faithful” model were that it is hard to explain how the observed sodium got into the vapor plume. Also, it looks like argon is concentrated in the plume, which is best done with liquid water. Kieffer admitted that this was “troublesome” but another commenter pointed out that radioactive potassium in the ice could decay to provide the Argon. There is still the problem that the amount of argon coming out with the plume is way more than could be continually produced, suggesting that argon built up for a long time and is now being released. That would mean we are seeing a “special” event, and scientists are always hesitant to invoke special circumstances to explain an observation. After Enceladus, I headed over to the session on planetary interiors. This session talked about all sorts of different objects, including everyone’s favorite two-faced moon of Saturn, Iapetus. Iapetus has a bizarre ring of mountains encircling its equator and a couple of talks tried to explain why that might be. Previous theories suggested that the ridge could be due to Iapetus changing shape as it began to spin slower, but Mikael Beuthe said that scenario wouldn’t produce the right kind of faults in the crust. He suggested that a better explanation would be if the crust was slightly thinner at the equator and Iapetus shrank as it cooled, causing the crust to buckle along the equator. A second talk by David Sandwell suggested the somewhat strange idea that the ridge was formed when the planet contracted due to melting of the interior ice, causing the outer spherical shell to collapse in two hemispherical halves. After these talks, there was some discussion and several scientists pointed out that it’s hard to explain massive faults right along the equator but nowhere else. Those people favored an origin related to material accreted from the rings. 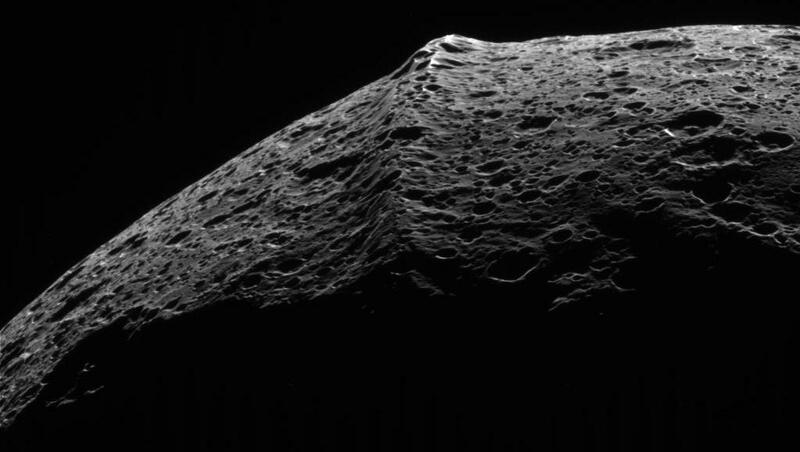 Iapetus' equatorial ridge towers above the limb in this view from Cassini. The other reason that I attended the planetary interiors session was that several talks speculated about “super-earth” exoplanets. C. Sotin (I didn’t catch his full first name) addressed the question of whether super-Earths would be more or less likely to have plate tectonics than the Earth. One paper, based on scaling up the equations that govern the process on Earth, suggested that super-earths would have plate tectonics, but a different paper based on simulations said exactly the opposite. Sotin took a look at both sides and concluded that it’s not just a simple function of the mass of the planet. Lots of unknown factors like water content, changes of phase deep in the mantle, and the degree to which the primordial crust is fractured all play a role. 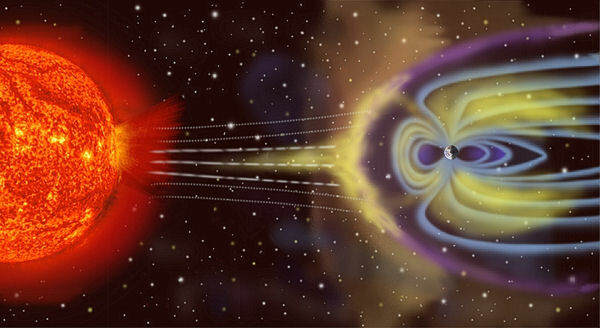 Cartoon of the solar wind interacting with Earth's magnetosphere. Another talk by Peter Driscol took a look at how to get “optimal” geodynamos in rocky exoplanets. He showed that, to get the maximum magnetic field from an Earth-sized planet, it should be slightly hotter than the Earth, but that Earth is still pretty darn good. He also said that it could be possible to detect the radiation from charged particles in the stellar wind spiraling through the planet’s magnetic field! The observation would have to be made from above earth’s ionosphere, and the most likely candidate would be a planet with a big convecting core (and therefore a powerful magnetic field) orbiting a nearby star which has a strong stellar wind. One of the comments after Driscol’s talk, directed at everyone working on super-earth dynamics struck me as extremely significant. I didn’t catch the person’s name, but he pointed out that everyone assumes that the mantles of super-earths behave like the earth’s mantle, but in actuality, under the enormous heat and pressure silicates would actually break down and behave like a metal, much the same way that hydrogen becomes metallic inside Jupiter and Saturn! 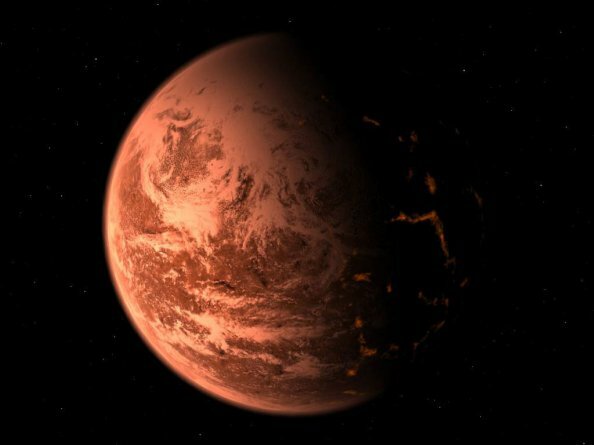 If Si really does become metallic in super-earths, then that would have lots of bizarre consequences, likely powering much stronger magnetic fields and possibly changing the heat-flow out of the planet. Finally, Linda Elkins-Tanton talked about what the mantle convection would be like on a tidally-locked rocky planet. Such a planet would always have one side facing its star while the other would be in constant darkness. Elkins-Tanoton and her student Sarah Goldman found that the powerful heating on one side of the planet and cooling on the other side would drive a continuous upwelling plume on the hot side of the planet and a matching downwelling plume on the cold side. In extreme cases, this could lead to the presence of “magma ponds” on the sunlit side of the planet, which are constantly spilling away from the hottest point and eventually freezing. That sort of mass redistribution could make the planet want to re-orient itself. They have not yet considered what an atmosphere would do to the magma ponds, but likely it would transfer the heat away more effectively, making the ponds more prone to freezing. This computer model shows that the sun-lit side of a tidally locked planet can get extremely hot, and the dark side can get extremely cold, but temperatures might be moderate right on the day-night line. The universe just got a little more crowded! Space.com is reporting that Astronomers using the European Souther Observatory’s 3.6m telescope in Chile have discovered 32 new extrasolar planets. 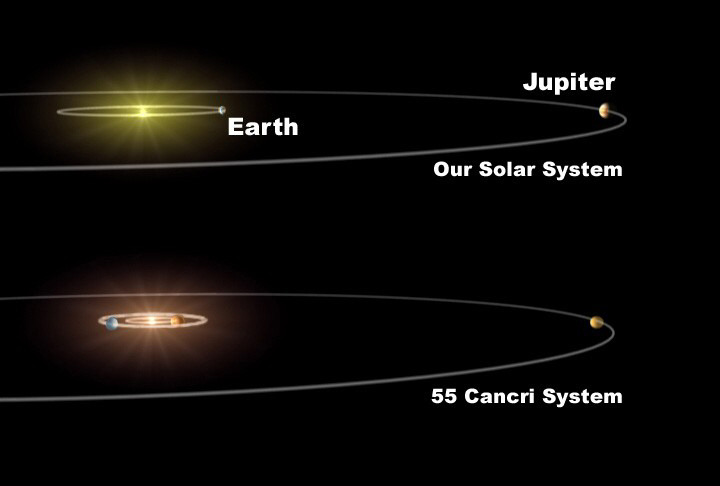 The smallest of these could be ~5 earth masses, while the largest would dwarf Jupiter! Check out the full story here. Hello folks, apologies for the lack of posts lately. I have been keeping busy trying to write up a draft of a paper on the Gale crater landing site for MSL, which is taking a very long time and becoming very large. I don’t anticipate having lots of time to post here this month. Even as I work on the draft, I will be traveling out to Los Alamos National Lab next week to begin analyzing some rock samples by vaporizing them with a laser, and then I’ll be rushing back to Ithaca to try to cobble together a coherent outline for my PhD thesis. I then get to defend that outline in front of my committee in early July. Assuming I survive that, they pat me on the back, hand me a master’s degree, and say “now go do all that stuff you listed in your outline”. All of which is to say that posts here will be less frequent (unless you want to hear about planning a sci-fi novel or the mundane aspects of making figures for a paper). 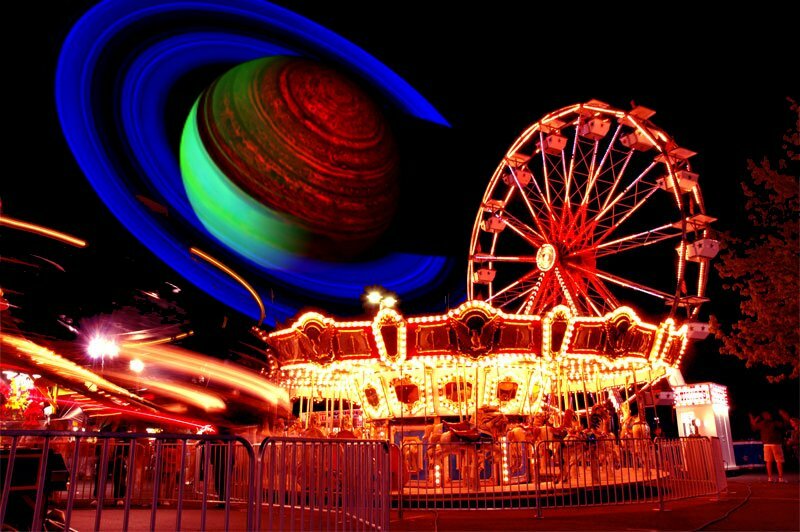 In the meantime though, other space-bloggers are writing some great stuff, and as always you can get a good sampling at the Carnival of Space. This week it is hosted by Next Big Future. Go take a look!